At Wolff & Wolff Trial Lawyers, our goal is to treat each client as the most important client and to provide valuable legal services that come with over nine decades of collective practice. We've successfully represented over 8,000 clients, tried over 100 cases to a jury and have collected over $170 million. At Wolff & Wolff Trial Lawyers we are always prepared to take your case to court if necessary. If you hire us and we accept your case, OUR ST LOUIS PERSONAL INJURY LAWYER EXPERIENCE, KNOWLEDGE, AND UNDERSTANDING OF THE LAW WILL HELP US GET YOU THE MONEY YOU DESERVE. We are in this business to help people and we are here to help you. If you've been injured because of someone else's negligence it can be overwhelming and confusing to figure out the next step. 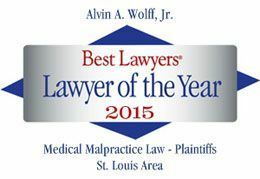 At Wolff & Wolff Trial personal injury lawyers in St Louis & Clayton are always here to help. And most importantly we know how to help. An attorney will help you determine if you have a claim. Often times, people are not sure if they have a claim. After talking to you, we will help figure out if your claim has merit. We will investigate as quickly as possible to let you know one way or the other if we can help. We will shoot you straight and give you the honest answer, even if it is the difficult one. Hiring an attorney early helps protect the evidence. Many incidents are video taped and the tapes are only preserved for a short time before they are erased. Your car may be towed away or sent to the junk yard before it is photographed. Memories fade as well. Witnesses can disappear or have their recollections corrupted by insurance company employees or the passing of time. Frequently we see errors in the police report or medical records. If these errors aren't discovered and fixed quickly, it could be implied that you agree with these incorrect conclusions within these critical records. These uncorrected mistakes can significantly hurt your case. An insurance company may be calling you asking you to give a recorded statement or sign papers before you are properly prepared to give a statement or know the full extent of your injuries after a trauma or injury. A ST LOUIS PERSONAL INJURY LAWYER WILL HELP YOU GET MORE MONEY THAN YOU COULD GET ON YOUR OWN. Insurance companies may offer you the value of your medical bills and maybe a little bit more, when they know that your claim is worth much more than that so that you sign a release before knowing what your claim is really worth. You need Wolff & Wolff Trial Lawyers to ensure you are being provided the representation you deserve. We know after a serious injury, it's not uncommon for you to be forced to take time off from work and yet the medical bills continue to pile up. Call us and let us be the ones who focus on getting you the justice and compensation you deserve. We are located across the street from the St. Louis Galleria in the University Tower and are handicap accessible. The Missouri Bar requires a disclosure that contacting an attorney on this website does not constitute an attorney client relationship. Legal advice is not given here and any past case results listed have no bearing on what your case might be worth. Every case rises and falls on its own particular merits. Below you can find our areas of practice. If you do not see your specific problem listed below, give us a call anyway and we will let you know if there is anything we can do.